WisdomLeap courses are available online and offline. Buy the course in a pen drive to study without internet access. The videos in this site are very good. It explains every single topic in my book. I particularly liked the Geography, Political Science and Economics lessons. I enjoy learning Math through WisdomLeap. Every topic is explained in such a simple way. I was browsing through Google and saw WisdomLeap videos on youtube. I saw the video ‘Story of Village Palampur’ and liked the way Economics was taught. I then bought the solution on a pen drive. It is very useful and easy. I don’t have to worry about internet and I have my entire curriculum in my pocket. I don’t believe in sending my son for tuitions and personally help him in his studies. The video lessons with animations and practice question make study time for me and my son very enjoyable. Thank you so much. Take control of your learning. connect and construct your own knowledge. to score well in every exam. in hot summers and cold winters. answers from our expert teachers. ICSE and State Board curriculums. We are constantly pushing the boundaries and releasing new content and technology changes in our products. Do stay tuned for product updates and the latest happenings in the ed-tech world through our newsletter. Question. What is the distance between a degree of latitude and longitude? Answer. The distance between each degree of latitude is approximately 69 miles or 111 km. The range varies due to the slightly ellipsoid shape of the earth. It is 68.703 miles or 110.567 km at the equator to 69.407 or 111.699 km at the poles. Each minute or 1/60th of a degree is approximately one mile. A degree of longitude is the widest at the equator at 69.172 miles or 111.321 km and gradually shrinks to zero at the poles. What type of soil is found in the deltaic region of the eastern coastal plains in India? State the major features of the particular type of soil. 1. It consists of sand, silt and clay. 2. Alluvial soil is very fertile. 3. It contains adequate proportion of potash, phosphoric acid and lime. 4. This soil is intensely cultivated. 5. It is ideal for the cultivation of sugarcane, paddy, wheat, cereal and pulses. State the role of decomposer in the ecosystem? The decomposer breaks down the complex organic substances into simple inorganic substances that go back to the soil. These inorganic substances are once again used by the plants. The cost of fencing a square shaped garden @ Rs.3 / m is same as the cost of watering it @ Rs. 4 /sq m. What could be the length of the garden? Let the side be s metre. Length of fencing = Perimeter of the garden = 4s. Cost of fencing = 3 x 4s = Rs. 12 s .
Area to be watered = s2. 12 s = 4 s2. Thus, the side of the garden is 3 m.
Sign Up and Start Learning For FREE! OR USE YOUR E-MAIL ADDRESS. Enter your email below and we will send Reset password link to your mail. WisdomLeap is a product of CarveNiche Technologies, a leading learning and curriculum company. We are committed to delivering personalized learning products to empower the next generation of learners. 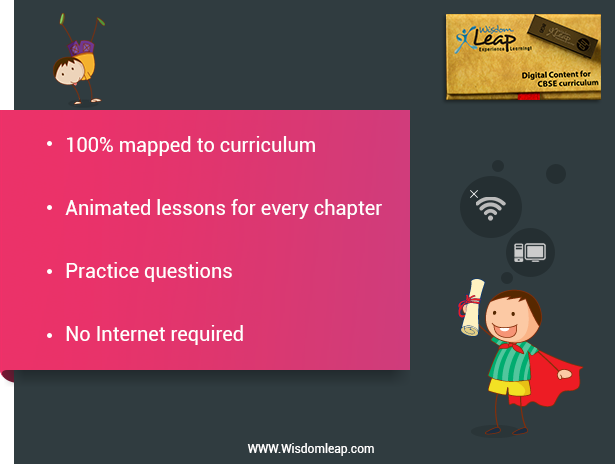 WisdomLeap is a CBSE empanelled product for self-learning. Our team of academicians and technologists are constantly working to bring out the most innovative products to make learning fun and meaningful. Copyright © 2015-17 CarveNiche Technologies Private Limited. All rights reserved.